We started with some pan-seared scallops with black truffles. 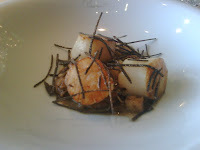 The scallops were perfectly fresh, and the aroma of the black truffles is just overwhelming. 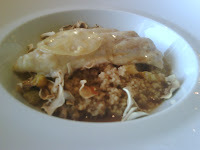 The whole thing sits on a bed of what looks like apple confit, and I must say that the tastes worked well together. I had half a bowl of the mushroom soup, which was rich, creamy and delicious. It doesn't hurt that they laid plenty of dried mushroom slices as well as a bit of black truffles on top. Once again I come away smiling from a meal at Pierre. Looking forward to my return next weekend!